I like to play and create evocative and beautiful objects from all sorts of materials, so I became an artist. I’ve loved books since I was a small girl so I focus much of my artistic passion on them. I collect all sorts of things: natural objects, boxes (ones I make or old ones bought from antique or junk shops), old hardware and other tools or implements; paper, books, illustrations and photos, and other ephemera, and then play with them. I manipulate and arrange objects, rough them up sometimes; nail, paste, or sew them, paint, stain, and dye them. I experiment. For instance, I throw sawed off bound pages from a book into the bathtub, let dry, and see the shapes that emerge. Then I dye or paint them. And I make and play with books. Much of the time I have little idea where I’m going with a creation, but figure I have to just enjoy the ride, whatever the destination. 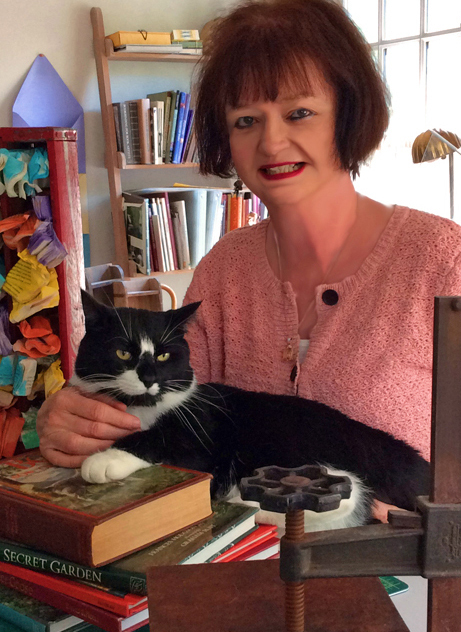 The artist with her studio assistant, TeddyBoy Sinclair.